Why I chose this book: Okay so before I wrote this I decided to watch the movie trailer for If I Stay, and now I’m crying like a big huge baby. Why did I choose this book? So many reasons! For one, this book is one that everyone and their dog is talking about. Yes, even dogs have been found to cry whilst reading this book. When I read this book I was craving a heart wrenching read, and I knew that this would be the book for me. I was totally right. Warning, the feelings train is right around the corner. 1. Metaphors that make you swoon. I could tell within the first few pages that Forman was going to be my metaphor writing homegirl. I am a sucker for a good metaphor, and goodness does she deliver. While I appreciate flowery writing, I love it even more when it adds to the plot and telling of the story. As Mia progresses throughout the story, the writing blooms as well. Together they tell a story of a girl trying to find strength when all hope is lost. MY HEARRRRTTT. 2. You will cry. YOU WILL. Forman does not mess around when getting to the heart of the book. Your heart will be torn right from the very beginning. While this isn’t a fast paced book, Forman does a splendid job of balancing the idea of tragedy and loss with flashbacks of Mia’s life. You see what brought Mia to this point and you can feel exactly what she is going through. Dying is easy. Living is much harder. On top of that, Forman reminds the reader that grief is never an easy pill to swallow. While it is complex and occasionally overwhelming, it is a core part of life that is necessary for every human to experience. One of the many things I loved about this book was the idea that beautiful things can still come from pain and suffering. While Mia’s life may seem in ruins, the reader also sees a beautiful profusion of moments that have made her life so beautiful. Moments that allow her to see that life is still worth living. Everything happens for a reason, and what you do with what has been given to you is vital. I loved this book. It was heart breaking, beautiful, and thought provoking. 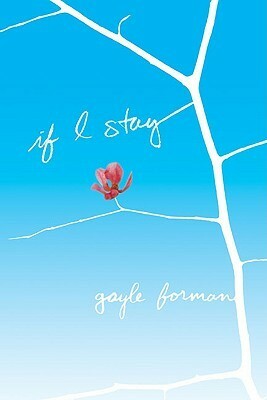 If you are looking for a quick read that will definitely make you feel (unless you are a heartless monster, but that may be your thing), then check out If I Stay. I know! I was talking with Amanda and we both decided to each bring tissues. I am sure I will have the same emotions for TFIoS! The trailer is beautiful! It made me really excited to see the film. I am hoping that it stays true to the book. I guess I'm a heartless monster! LOL... This book really didn't do anything for me. I know I'm in the minority, though. THIS MAKES ME HAPPY! I love it when people read some of my favorites. I absolutely can't wait for the movie because the book was so heartbreaking. However, the sequel has me even more excited!